The growth of Christianity in Vietnam has been charted by World Magazine, which says religious freedoms enjoyed by those living in cities are in stark contrast to the country’s rural areas. Catholicism has a centuries-old history in Vietnam, but Protestant churches only sprang up last century, the Christian publication notes, giving them only “64 years to take root before the Communist government took over South Vietnam in 1974”, after which churches and Christian schools were closed and foreign missionaries forced to leave the country. 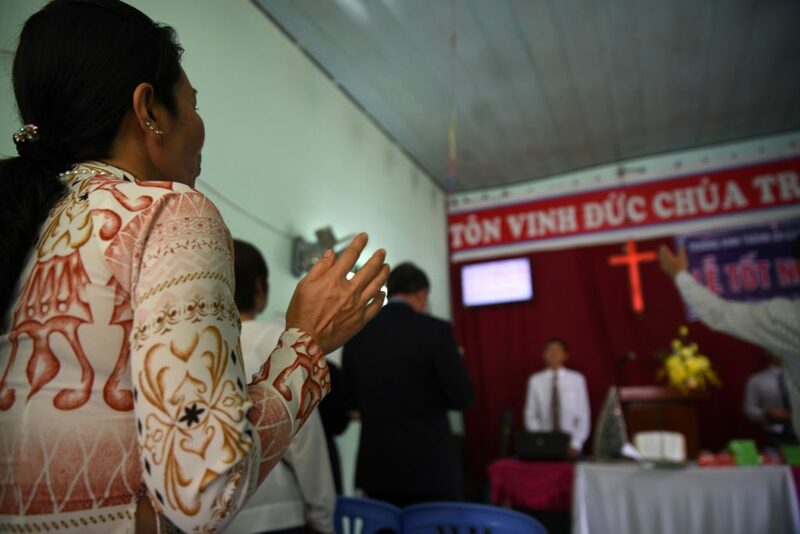 In modern-day Vietnam Protestant churches thrive in the cities due to the country opening up to the West since the 1980s, according to World. In 2001 the government officially recognised the independent Evangelical Church of Vietnam (ECVN), and has encouraged its offshoot, the Vietnam Evangelical Fellowship, which formed following a split in the ECVN. But the story is different in rural areas, especially in the mountainous areas, where minority ethnic groups make up 75 per cent of Vietnam’s Christians. The ethnic group with the largest growth in Christianity is the Hmong people. However they are viewed with distrust by local authorities, who remember that the Hmong sided with the US in the Vietnam War, and there is a fear that “a mass conversion to an American religion would rally a Hmong independence movement”, says World. The Hmong continue to be harassed under the pretext of preserving their “traditional culture”. In March, 24 Hmong Christians were attacked by a mob led by a village chief wanting them to renounce their faith. The new Law on Religion and Belief that came into effect on 1 January “concerns” Christian groups, says World. While it might benefit urban churches, “allowing them to establish medical, educational and social institutions”, it could be used to persecute Christian groups in remote areas that the authorities feel “threaten the national unity”. “Vietnam is an unpredictable country regarding its direction, its economy, its politics, and even [its view of] religion,” said Pastor Huy Le of Grace Baptist Church in Ho Chi Minh City. Meanwhile, in an open letter to French president Emmanuel Macron, ahead of a visit to the country by Vietnam’s Communist Party General Secretary, Nguyen Phu Trong, three France-based human rights organisations have pressed Macron to raise human rights concerns with Trong. The letter makes reference to VCHR’s report that said 2017 was the “worst year” for dissidents in Vietnam, and mentions particular cases including Vietnamese Christian Maria Tran Thi Nga, who was arrested in 2017 for sharing articles online and is currently serving a nine-year sentence for “propaganda against the state”. The letter urges the French president “to insist that Vietnam upholds its commitment to the international community to respect and guarantee human rights”. Nguyen Phu Trong’s visit to France from 25-27 March marks the 45th anniversary of Franco-Vietnamese diplomatic relations and the 5th anniversary of the Strategic Partnership between France and Vietnam.